A rainy weekend at the Lake of the Ozarks didn’t stop some 3,000 amateur anglers from participating in the Midwest Fishing Tournament’s Big Bass Bash. 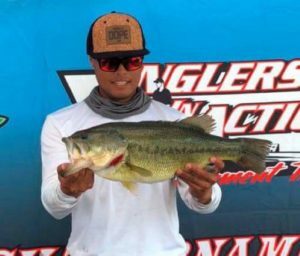 During the rainiest part of the weekend, Sunday afternoon, Oliver Ngy from the state of California hooked a 6.82 pounder – the biggest catch of the contest. The monster led to Ngy taking home more than $100,000 in prize money. Ngy’s bass edged out the 2nd-place fish by .01 lbs. Around the same time Ngy was catching his winner, Travis Meyer landed a 6.81-lb bass. It was Ngy’s first time ever fishing at Lake of the Ozarks, but Ngy is well-known in the angler community as a big bass fisherman. Ngy’s largest catch ever was a 17-pound largemouth bass on a lake in northern California. 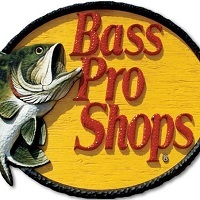 The Big Bass Bash is held twice a year—April and October—at Lake of the Ozarks. J.T. 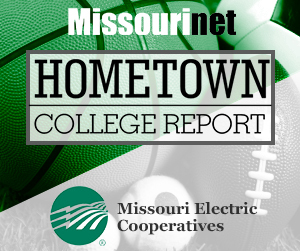 Gerlt of Missourinet affiliate KTKS in Osage Beach contributed to this story. Grilled or pan fried…doesn’t matter. Missouri turkey is delicious. Hard to believe that after nearly ten months of planning, studying, practicing and hunting, my time with the Missouri Department of Conservation and my journey with my two mentors, Kyle Lairmore and Jim Low, is coming to an end. 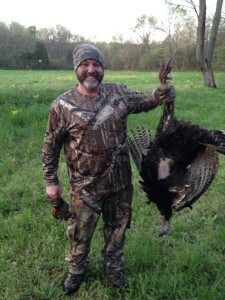 You’ve followed my steps from hunter education through deer, duck and now turkey hunting and I hope we’ve provided good information along the way to help you get started. The final step, now that I was able to harvest a turkey on my first hunt, is to show you how to prepare this delicious meat that is a great protein source. On our final video (watch below), Kyle will walk you through a quick and easy, pan fry and bake recipe that goes great with rice and vegetables. Ever since we’ve hosted Thanksgiving at my house, I’ve prepared our bird on a charcoal grill. So I was really interested to see how a Missouri jake would turn out. 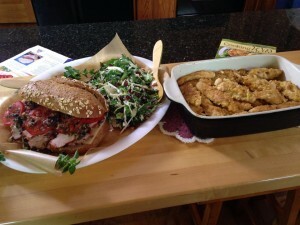 I was very happy with the results as we used the grill meat to make a delicious muffaletta from a recipe straight out of the Cooking Wild in Missouri cookbook. Of course, turkey season isn’t complete without Morel mushrooms! Another great resource is to get a copy of the Missouri’s Wild Mushrooms book. In fact, for being a faithful viewer and reader of my hunting journey, I want you to have an opportunity to win these great books. 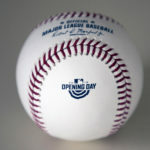 Click here to sign up to win. After going through the process of each hunt, if I had to pick a favorite, I would choose turkey. I mentioned several reasons in my last story, but the final decision came down to how delicious the meat tasted. I had heard from multiple people, hunters and non-hunters who all told me the same thing…store bought turkey doesn’t even come close to the taste of a native Missouri gobbler. Man, they were right! What I learned about hunting is that the whole experience isn’t just about whether or not you harvest an animal. The best part of this final video shoot was cooking the food, sitting down at the table and sharing a meal, great stories with plenty of laughs. That’s what truly completes the experience. Here’s a post on the Department of Conservation’s Facebook page that I think sums up what hunting is all about. This comes from Randy H.
I know I started this post by saying that my journey was coming to an end, but that’s incorrect. It is really just beginning. 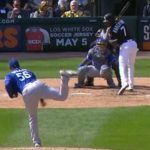 Two things I’ve learned already about the spring. If I enjoyed my first time deer hunting, I’ll really get a kick out of turkey hunting. Second, the turkey tastes really good. 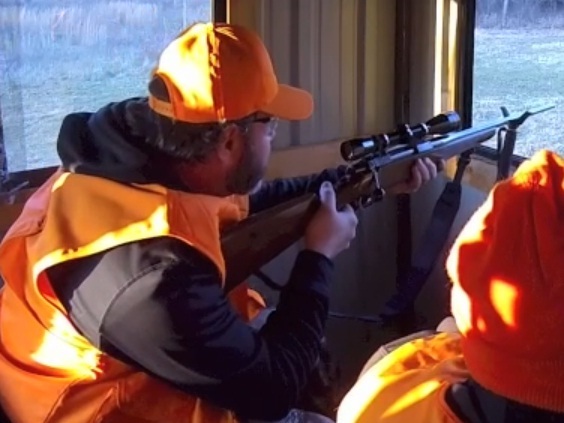 If you followed us in the fall, you know that I tried my hand at hunting during the deer season and then duck season with Kyle Lairmore and Jim Low of the Missouri Department of Conservation. Now, I’m ready to give turkey hunting a try. 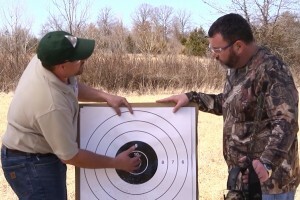 I’ve had friends and acquaintances tell me over the winter how they enjoyed watching my videos that took us from safety courses, to training at the range, to the hunt and preparing our harvest. Many people, including Kyle, told me turkey hunting will be a new and completely different rush from deer and duck hunting. Before we get started, Kyle will share some basic information (Watch our Hangout below) on turkey hunting, which begins on April 11th and 12th for youth season and the adult season runs from April 20th to May 10th. Missouri boasts the largest turkey population in the country. 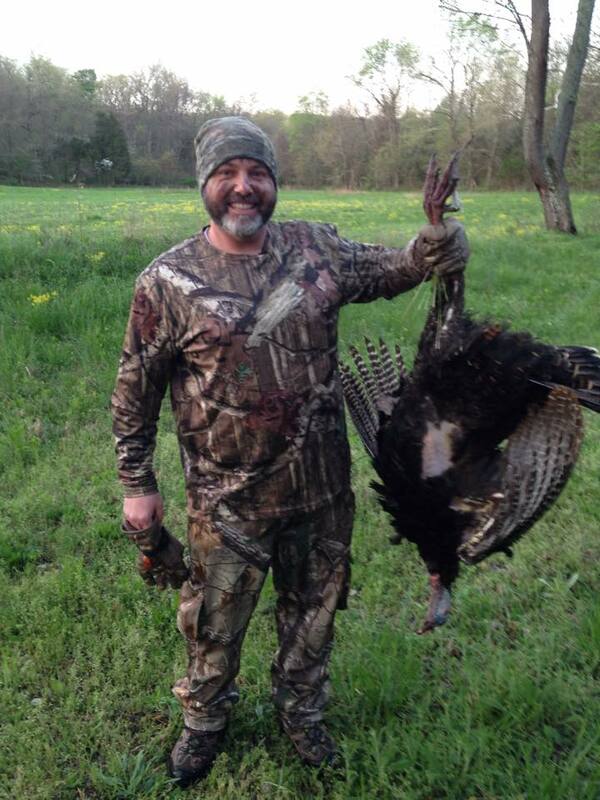 We have the eastern turkey here in Missouri, but hunting is still a challenge. These birds are smart and the right steps need to be taken to have success. 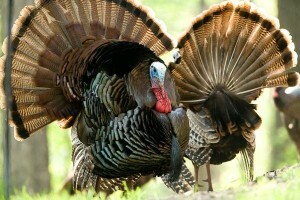 The requirements for turkey hunting safety and certification are the same for deer. March and April are really the hot times for finding a class as hunters from across the state are getting ready to hunt. Click here to get signed up. During turkey season, hunters will be using shotguns and its important to pattern our firearms to help with a quick, clean harvest. In closing, there are many adults who would like to hunt in the state of Missouri, but for whatever reason never started and may feel uncomfortable trying now. My advice to you is don’t hesitate. I’ve been lucky to have Kyle and Jim from the department take me under their wing (excuse the pun), but hunters all across the state are willing to take time to show you. So if you have some friends who hunt, ask them to take you along. They’ll be more than happy to share their knowledge and expertise. 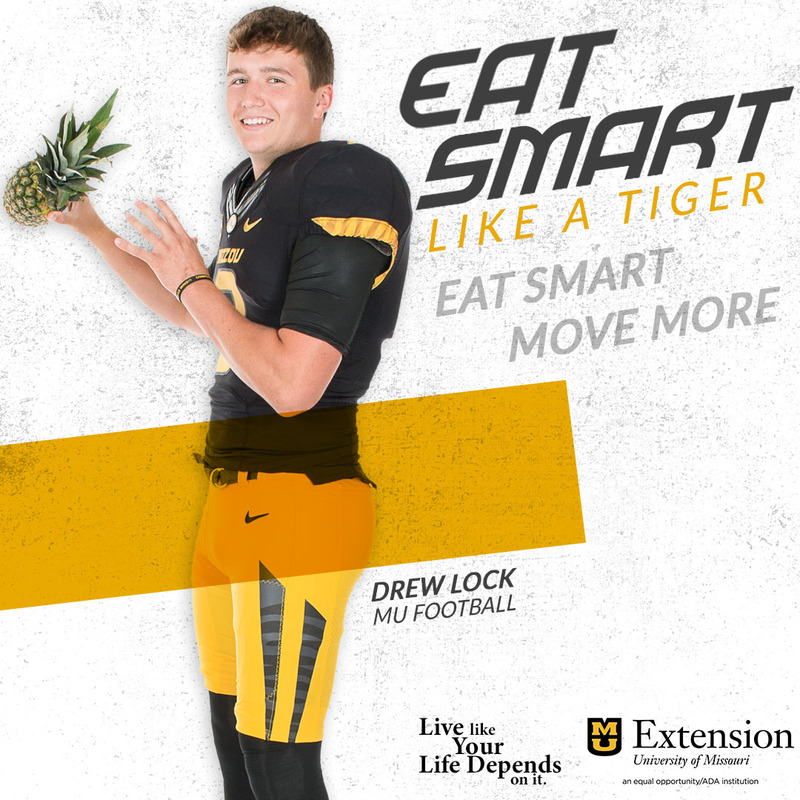 Plus, you can always call on the Missouri Department of Conservation to help. 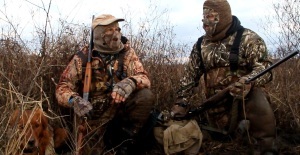 Enjoy our video and check back here soon for our next video in the series as we’ll pattern our shotgun and get our gear and permits before our hunt. I didn’t realize that perhaps the most fun I would have during my Adult Onset Hunting experience would be the last day…the cooking segment. 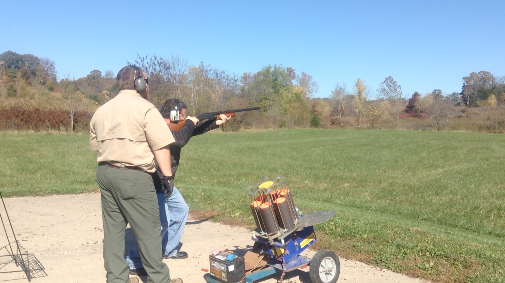 At the beginning, I was just excited to become a licensed hunter and to be able to get some work done on the range. I set a goal for myself to harvest a deer and a duck. While I only came through on 50% of that, (harvesting a doe), I was very satisfied with me overall performance. Yet, the preparing, the cooking and then enjoying a meal that came from all my hard work was much more rewarding that I expected. This is what hunting is all about. Being able to provide food for family and friends and offer a healthy food alternative. Bringing food from the field to the table completes the circle. I was fortunate to have two mentors who were able to take me every step of the way, including this final segment in the kitchen. 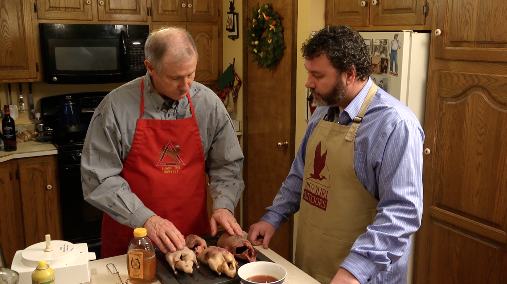 You’ll watch Jim Low and Kyle Lairmore as they show us some great recipes for duck and deer and how easy it is to prepare. Join us on the final Google Hangout of this series. For more additional information on the deer recipes, find the attachment below this Google Hangout. 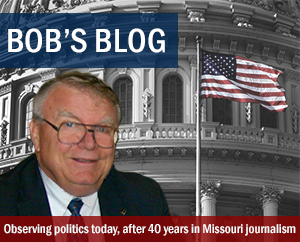 Bill Pollock sets his sights on a potential harvest as sunset nears in Gasconade County. It was “D-Day” for me…as in deer. After spending the last couple of months becoming a certified hunter through the Missouri Department of Conservation, and hitting the range for practice, I got my warm clothes and hunter orange, picked up my tags and now I’m finally ready for my first hunt. I was joined by Kyle Lairmore, Hunting Education and Shooting Range Coordinator from the conservation department, as we headed out to Pigg Hollow Farms in Gasconade County. We set out in the afternoon after lunch and got set up in our elevated blind just after 2 p.m. After we got settled into the blind, I tried to take in my surroundings, using landmarks, such as trees, or different shades of coloring in the field to help determine distances that I knew would be within my shooting range of 150 yards and closer. Then I scanned the field looking for any deer movement and kept my own movements and talking to a minimum. In our third Google Hangout of this series on Adult Onset Hunting, you’ll hear Kyle and I talk about how perceptive deer are of their surroundings. When you enter their environment, they are very in tune with things around them. The biggest question I was asked by my family and friends was if I was nervous when I set my sights on my first harvest. Yeah, I was excited, but I have been waiting for this opportunity. For the last few weeks, I’ve visualized how I would approach my first attempt. Constantly reminding myself to stay calm, control my breathing and to remember the most important aspect of a hunt is to go for a quick, clean, harvest. My biggest concern was that I didn’t want to rush a shot, or take a bad shot with a low success rate to where I would just wound the deer and that’s not what I wanted to do. I was more excited seeing a buck through the brush and then when I saw three yearlings and a doe behind us, but once I decided to make an attempt, I actually felt calm and confident for my first harvest. How would things actually workout? 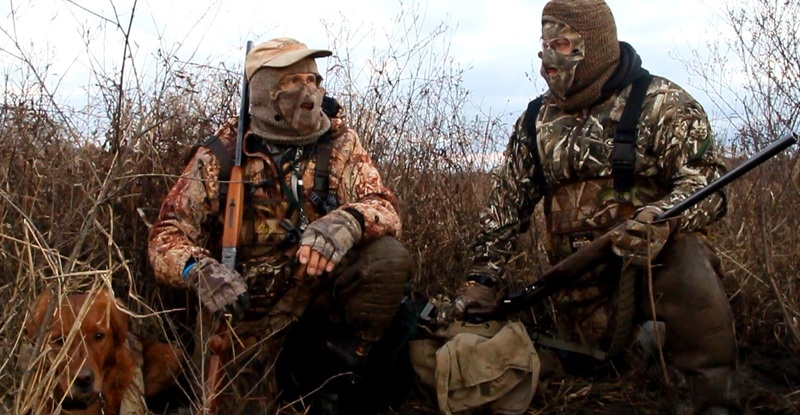 Watch our Hangout as we take your through my first day of hunting from start to finish.